Adrian Steel's new RAM ProMaster upfit features storage solutions designed to benefit locksmiths. Adrian Steel releases new upfit for RAM ProMaster. Adrian Steel has just released an upfit for the new RAM ProMaster. 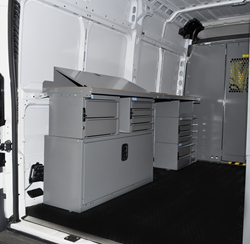 This interior was revealed at the 2014 NTEA Work Truck Show and is specifically designed for locksmiths, to increase efficiency and organization while on the job. This new Adrian Steel Locksmith Interior for the RAM ProMaster offers a multitude of storage features designed with locksmiths’ needs in mind. There is plenty of storage space within locking cabinets and drawer units for large and small cargo. The RAM ProMaster Locksmith Interior features a workbench that gives locksmiths a surface to actually work on in the van. It features a key machine base that elevates the key machine up to a comfortable position to cut the keys. Other features include 84" of worktop surface, two #9 Four Drawer Shallows, two #19 Two Drawer Mediums, a #40H locking Wheelwell Cover Cabinet and a #17A Shelf Catalog File. The interior also features a Drawer Cabinet Module that includes a #9 Four Drawer Shallow, two #12 locking Cabinets, a #19 Two Drawer Medium, a #40H locking Wheelwell Cover Cabinet, and a #43 Three Shelf Catalog File. With Adrian Steel’s exclusive Lock ‘n Latch system for drawers, customers have a choice of keeping drawers open, closed and unlocked, or in a closed/locked position. Drawers are made of an engineered composite material for durability with heavy-duty drawer glides for support and smoother drawer operation. Cabinets come with locking recessed tee-handles for secure storage and receive a durable gray powder coat finish. This Locksmith package also includes a complete Partition with a hinged, locking door for access between the cab and cargo areas. To learn more about the Adrian Steel Locksmith Interior and accessories for the RAM ProMaster, please visit http://www.adriansteel.com.